Here’s another Showy Garter pattern I’ve been looking forward to sharing with you. 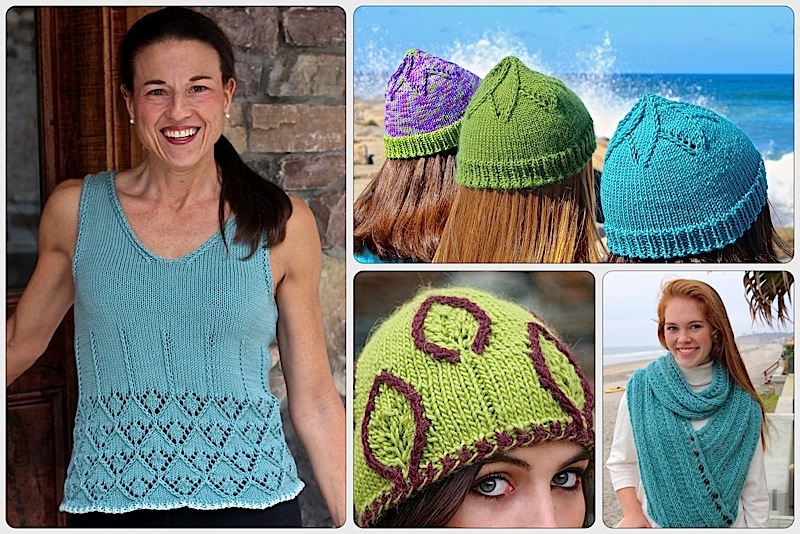 It’s the first of a series of holiday gift knitting ideas I’ll be posting in the next few months. As you can see, the photos were taken last winter. I took advantage of my son’s college break visit to Tahoe to snap a few photos. One might even say I ambushed him as he was peacefully out snow shoeing in shorts (I don’t know what to say about that). This tendency to photo ambush unsuspecting people in my life is well known to members of my family. Few are safe when I have a finished project around. In this case, not even our dog, Domino. What is the Showy Decrease again? It’s a simple modification to a line of decreases that turns them into a decorative element. The line can lean right, left, curve or run vertically. We’ve used the Showy Decrease is a lot of ways, but focusing on the Vertical Showy Decrease for now, it works to make dramatic ribs, decorative lines and even pleats. Here it’s used in the Smart Baby Blanket from the last blog and below in the Fiftyfifty Shell, Snowed In Headband, Arisaid pleated scarf and Zephyr Cove Scarf. In this pattern, the bricks are formed by starting and stopping short offset lines instead of continuing them from the beginning to end of a project. Add a color change to match the pattern changes and, ta da … you get bricks! I am definitely not saying this design isn’t for women but I will say that the men in my life are really hard to knit for so I’m pleased to have an option that works for them. Just think about using sports or college team colors – it would make the perfect holiday gift. I’d take the two team colors and add a neutral (white, gray, tan) so the scarf isn’t too stripy. Try this neutral color palette too. This is still a mostly knit stitch project so it works up quickly. It would also make a fabulous baby blanket. Please, somebody knit a baby blanket! I’d love to see one. As always, this pattern is available on Ravelry. This pattern is free as it will act as a tutorial for future brick patterns. I am hoping to see lots of different colors and sizes in the projects you knit for you and your family. And one more photo to show what a trooper my son, Graham was. This is what happens when your mom asks you to sit in a snow bank to get a better angle for a shot. Not my fault he was wearing shorts! Love it, but your son’s smile was the best. You need to teach the dog to smile, although he’s adorable too. Oh, and love your knitting! I hope your boy turns out as clever, innovative and helpful as his mum. I love this idea. As a true left handed knitter, I find purling twice as fast as knitting, so doing garter is great, especially when it is so dressed up with your ideas. This entry was posted on September 17, 2018 by Laura Cunitz in Nuances, Scarves, Showy Decrease, Showy Garter and tagged garter stitch, knitting, Knitting Pattern.